Wanted to get feedback before calling VWoA. Wife owned a GTI, had the chain tensioners fixed by an indy mechanic. We got a letter about the lawsuit and sent in all required info, got this in the mail today. Does the work have to be performed by a VW dealer? That seems to be what the letter is stating. Class action? In other words, where victims get like $14 each (via some kind of voucher), while some law firm makes $8m? Wow, VW and BMW must have used the same design. -called the settlement phone number. It said a 9 minute wait and turned into 35 minutes. -since my claim was filed online, agent could not tell me anything but to do what the letter states. He did say that they are getting a lot of calls for the same issue. -suggested that I send an email as well as reply to the letter. -I checked and all my paperwork was in order. I used an independent shop but the info requested was clearly on there. Any odds to the notion that they have people screening the claims and if it wasn't done at a dealer, they send Form Letter 814c denying the claim and hoping you go away? That's not what the original claim information said. . .
ETA: If anyone wants a copy of this page without my quilt, remote control or purple nail polish, I can take another. I sent an email with this photo attached, asking what documentation was required. They have provisions for independent shop in the damn settlement. Contact the law-firm they settled with. This is a breech of contract. The onus is on them not the injured parties. Volkswagen has agreed to a settlement that would end a multidistrict litigation claiming that many vehicles’ engines have a timing chain tensioner that’s defective. If approved, the potential VW settlement deal will resolve a two-year long multidistrict litigation. Multiple class action lawsuits that were filed as early as May 2016 claim that a defect in Volkswagen vehicles engines, and engines in the company’s Audi brand, possess a defect that cause the engines to randomly fail, putting drivers and others at risk for injury or death. This settlement, if approved by the court, would cover the cost for many Volkswagen and Audi drivers to have their vehicles repaired. The proposed Class of drivers include anyone in the United States and Puerto Rico who purchased or leased one of a number of Volkswagen and Audi vehicles made between 2008 and 2014. Volkswagen has agreed to extend warranties on the timing chains and timing chain tensioners in affected vehicles to cover the parts for 100,000 miles or for 10 years. Under the terms of the proposed settlement, if the timing chain tensioner fails within 10 years or 100,000 miles, Volkswagen will reimburse drivers for the 100% of the cost of a new part if the driver has the repairs done at an authorized VW or Audi dealer. However, if the vehicle owner has the timing chain tensioner fixed at an independent vehicle repair service center within the 10 years or 100,000 miles, VW will cover the cost of parts and labor up to $1,100. Likewise, if a Class vehicle’s timing chain needs to be replaced or repaired within 10 years or 100,000 miles, Class Members will receive a refund of the entire cost of labor and parts if the car is taken to an authorized Audi or VW dealership. Timing chain repairs or replacements that are performed on Class vehicles at an independent dealer will be covered up to $1,500. If drivers need both the timing chain and timing chain tensioner fixed or replaced, Volkswagen has agreed to cover 100% of the total cost if the car is taken to an Audi or VW dealer. Class vehicles that require both the timing chain and timing chain tensioner to be repaired or replaced will receive a refund of no more than $2,000. The highest recovery for Class Members who take their vehicle to an independent service center for an engine repair is $6,500 and will be subject to the same mileage/time constraints presented in the table above. The drivers state that in addition to the approved terms of the settlement, they will seek $2,500 awards for each of the named plaintiffs in the multidistrict litigation, as well as reasonable expenses and legal fees. The representation for the drivers state that they “have reached the conclusion that the substantial benefits the settlement class members will receive as a result of this settlement [are] eminently fair, reasonable, and adequate, especially when compared to similar settlements and in light of the risks of continued litigation.” Now, the drivers and Volkswagen are awaiting preliminary approval of their proposed settlement deal. According to the claims in the multidistrict litigation, the engine failure in many Volkswagen and Audi vehicles was caused by the chain tensioning system that would unexpectedly fail. The VW class action lawsuits stated that “when the Tensioning System suddenly and unexpectedly fails, the Class Vehicles lose engine power, which causes a loss in the ability to accelerate, maintain speed, and/or adequately control the steering wheel or engage the brakes.” Allegedly, this defect put drivers at a risk of collision, endangering their safety and the safety of others. Top Class Actions will post updates to this class action settlement as they become available. For the latest updates, keep checking TopClassActions.com or sign up for our free newsletter. You can also receive notifications when this article is updated by using your free Top Class Actions account and clicking the “Follow Article” button at the top of the post. The drivers are represented by Carella Byrne Cecchi Olstein Brody & Agnello PC, Kessler Topaz Meltzer & Check LLP, Kantrowitz Goldhamer & Graifman PC, Thomas P. Sobran PC, Mazie Seater Katz & Freeman LLC, McCune Wright LLP, Seeger Weiss LLP and Baron & Budd PC. Last edited by BRealistic; 03-08-2019 at 08:54 PM. My GTI has very low miles and never "needed" repair prior to this problem coming to light. 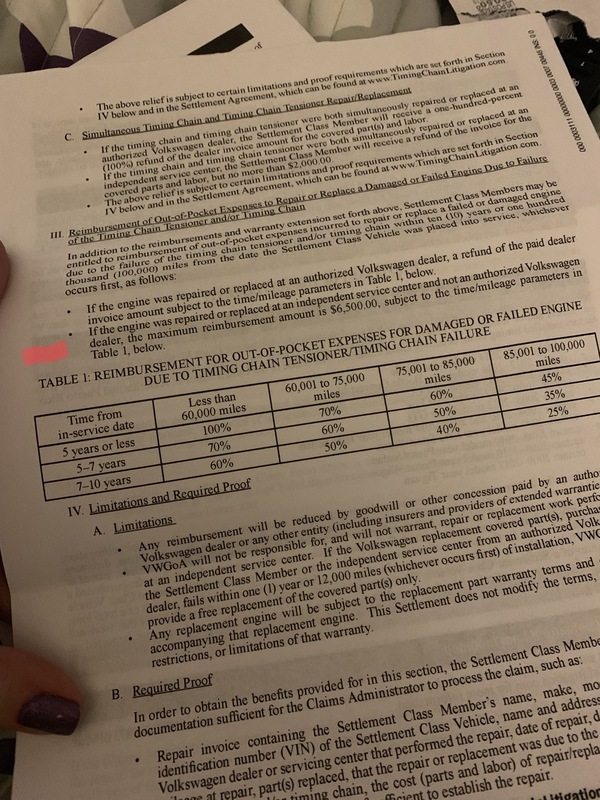 I interpreted the fine print of the settlement notification letter to state that the parts had to "fail" and/or "need repair" in order to get relief from the settlement. I didn't want to pay for work that was never going to get reimbursed. I wanted to change out the tensioner myself and I figured they would also weasel out if service wasn't done by a dealer. Hope the people with legitimate claims can get paid. I'll take the 1500, will be calling them on Monday...thanks for this page so I don't have to dig for it. I got the same letter saying that my claim was ineligible due to the fact that the tensioner replacement was done at an independent repair shop. I haven't had time to call the number yet. Has anyone who received a similar letter had any luck getting them to honor the claim? I'm also SOL because I had mine replaced at an independent shop. I had a turbo blow plus a few other things break and it wasn't worth paying the labor to have it all essentially taken apart twice. Sorry I misspoke.. I think my issue was that I replaced it proactively and that wasn't covered under the settlement. It was months since I've dealt with this and my memory is a little foggy. 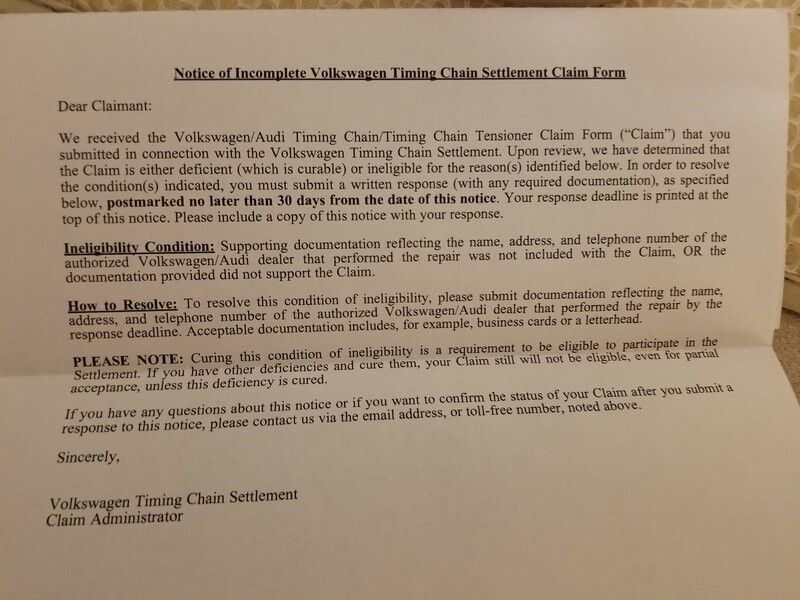 So in this thread, we see VW is legally required to pay out for claims and multiple people who got rejected with VW saying they didn't feel like paying for the repairs. Thanks VW. Lesson learned for me is to never keep a VW out of warranty, that's for sure. The new 6-year warranty makes them more attractive for sure, but I still wouldn't own one out of warranty. Last edited by col.mustard; 03-12-2019 at 03:29 PM. 2. You CAN have the repairs done by a shop of your choosing. Yet that letter is CLEARLY worded to make you think only an Authorized Audi/VW Dealer can do the work if you want reimbursement. They are trying to scare away claims that should be paid out as part of the agreement. That's why this need to go to the law-firm that handled the class action settlement. By doing this, VW could be opening themselves up to another class action lawsuit about the same exact thing. I can't imagine the higher-ups know this is how this is being (poorly) handled. VW needs to really watch their public image right now as they build trust back after the TDI thing. Last edited by BRealistic; 03-12-2019 at 12:42 PM. So what happens if it nuked your engine and you just sold the car? That's what I did (traded at a VW dealer). Nothing? Sent from my basement using two tin cans and a string. something something something... ownership is 9/10th of the law. That's what usually happens, however there was against BMW/Mini and their faulty timing chain tensioners (what is it with the Germans and their timing chains??) which I got the full amount of the service returned to me - about $1500. So it's worth filing.